MINNEAPOLIS -- Protesters in Minneapolis sent a loud cry of, 'NO!' to the Hennepin County Sheriff's Department after it sent Special Operations to terrorize Standing Rock. 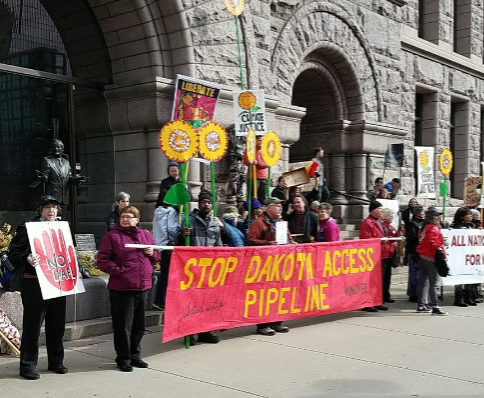 This comes after the City of Minneapolis passed a resolution of support for Standing Rock Sioux Nation and its fight against the Dakota Access Pipeline. 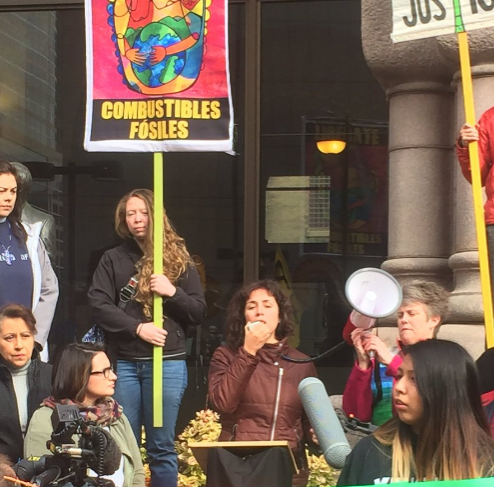 Minneapolis and Saint Paul were among the first US cities to send resolutions of support to Standing Rock, and deliver those. Now, three counties in Minnesota have sent militarized police and special ops to North Dakota, after the State of Minnesota approved it. Another protest is planned in Minneapolis for Friday. The militarized police force directed by Morton County Sheriff's Dept. has attacked peaceful water protectors, sprayed pepper spray in their eyes, beaten them batons, thrown them by their necks on the ground, stalked women alone in the fields, and arrested them without credible charges resulting in false imprisonment. Water protectors are strip searched after being charged with misdemeanors, even bogus ones. 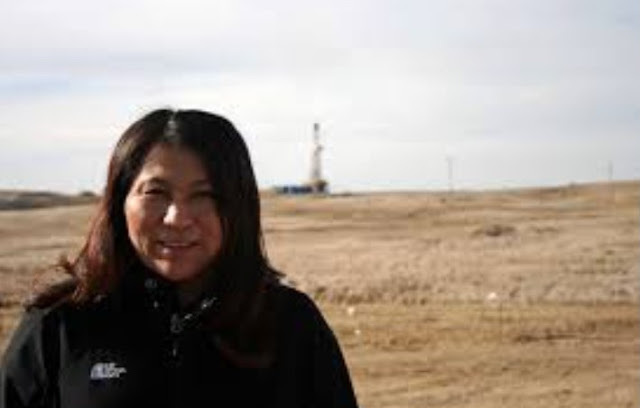 LaDonna Brave Bull Allard, who owns the land where Camp of the Sacred Stones is located, said her daughter was arrested without cause, strip searched and left in a jail cell naked by Morton County. Standing Rock Sioux Chairman Dave Archambault is urging the US Justice Department to investigate the police abuse. Mercenaries operating as Dakota Access Pipeline private security attacked water protectors with vicious dogs, and pepper sprayed them, on Sept. 3. The media has been targeted for arrest by Morton County Sheriff Kyle Kirchmeier. Already arrested and jailed: Cody Hall, spokesman for Red Warrior Camp, actress Shailene Woodley who was live streaming, and Unicorn Riot live streamers. Five Unicorn Riot live streamers were arrested at Standing Rock and in Iowa on the DAPL pipeline protests. Democracy Now producer Amy Goodman was charged, but charges were dismissed after she appeared at court. The judge found no credible basis for the riot charge, initially charged as criminal trespass. Sheriff Kirchmeier has engaged in a campaign of terror and lies, which the mainstream media and local press, with a long history of white supremacy and racism, has magnified. 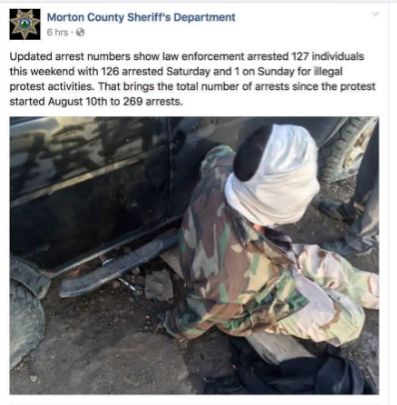 Morton County engaged in torture when it hooded a Standing Rock water protector during a lock down to protect the Missouri River water from Dakota Access Pipeline construction. Morton County Sheriff Kyle Kirchmeier posted this photo. 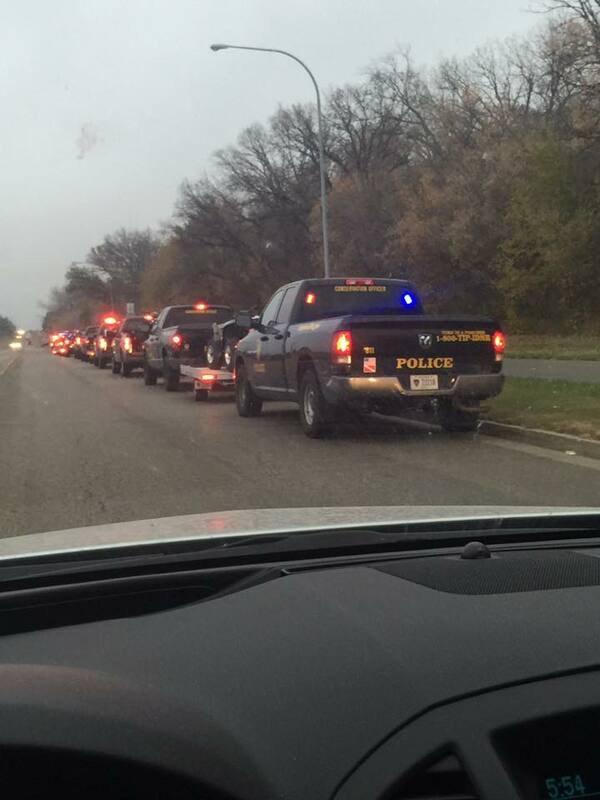 Below: Indiana police arrived today, shown photographed in Mandan, North Dakota.